The act of forgiveness does not magically erase the years of pain or instantaneously heal our heart wounds but it does realign our hearts with God's. Forgiveness gives us a heavenly perspective that dissolves barriers and makes restoration possible--restoration of our relationships, our hearts, and our God-given dreams. Relational restoration takes time and both parties must be willing to work at this. Complete restoration may not be possible, especially if betrayal was part of the break down. Rebuilding trust is difficult work and in our humanness, forgiveness may have to be extended more than once. Heart wounds leave scars. This side of heaven, no matter how much time has passed, or how well we've healed, our scars still show. But did you know scar tissue is the strongest tissue in the body? Scars remind us not only of our wounds but more importantly that God healed--restored and made new. In Madeleine L'Engle's book, A House Like a Lotus, her character Polly O'Keefe says, "There isn't anything that happens that can't teach us something, that can't be turned into something positive. One can't undo what's been done, but one can use it creatively." This is how God makes all things good. He takes our pain, our scars and makes us stronger. He intertwines the desires He's placed deep inside our DNA with our scars and makes something good--if we let Him. Facing my father--offering him forgiveness face-to-face--took months of courage and constant reminders from the Lord. But oh, the sweet walk of forgiveness can never be replaced and I am so glad I stepped out in obedience. That simple but difficult act not only restored a relationship but released God's blessing of creativity in my life that had been locked up for years. He's placed opportunities in my life beyond my imagination and birthed a ministry of encouragement that is at this moment still a work-in-progress. Forgiveness is a step of obedience and must precede restoration. Withholding forgiveness builds barriers between you and the other person but also between you and God. Although offering forgiveness takes time and courage, it's the only thing that breaks down those barriers and opens us up to the flow of God's blessing and restoration. Paul reminds us, "Therefore, if anyone is in Christ, he is a new creation; old things have passed away; behold, all things have become new" 2 Corinthians 5:17. Won't you allow God to make all things new? Oh Lord, thank you for your mercy and forgiveness through your son, Jesus. Thank you for restoring us and opening heaven's gates to us. Help us in our humanity, to offer forgiveness to those who have wronged us, in obedience to your will. 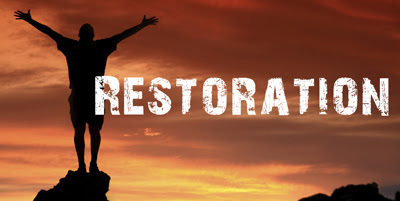 Restore us one to another and open up the flow of heaven's blessings in our lives. Amen.